My Mother has always taken a simple approach towards cooking. She doesn’t like over complicating things and her spice cabinet is limited to salt, red chilli powder, cumin and turmeric. If there’s a way to make cooking quicker, less messy and easier, she’ll always recommend it. This is the reason why my cooking style differs so much from my Mother’s – I am fascinated by the use of different spices, I love freshly grinding my own concoctions and if there is an authentic but much longer route to take in the kitchen, you bet I’ll be taking it. My Mother has always made her kofta curries in a very basic manner without using poppy seeds, gram flour, yogurt and I have never seen her grinding her spices. Her kofta curries always turned out good, but there’s something about the use of authentic spices that really can’t be outdone. I made this curry the day after my first anniversary for my husband as a bit of a special dinner, which is why I went the extra mile and ground my own spices. The extra work paid off well, alhamdulillah, and the results were spectacularly delicious! This recipe is most definitely a keeper and I think you should put it on your to-cook list NOW! Using a number of family resources, my own taste testing and just general desire to cook an out-of-the-ordinary dinner, I’ve developed this recipe and I think it has that ‘wow’ factor thanks to the freshly roasted and ground spices, the warm and earthy undertones of the cardamom and cinnamon and the vivid and fiery hue of the Kashmiri red chilli powder! Trust me, this little spice is a gem to add a pop of colour to any meal. It has a very mild flavour – in this particular recipe I’ve used 3tsp but believe me this curry is not spicy! If you don’t have Kashmiri red chilli on hand, don’t worry. Just replace it with red chilli powder to taste. 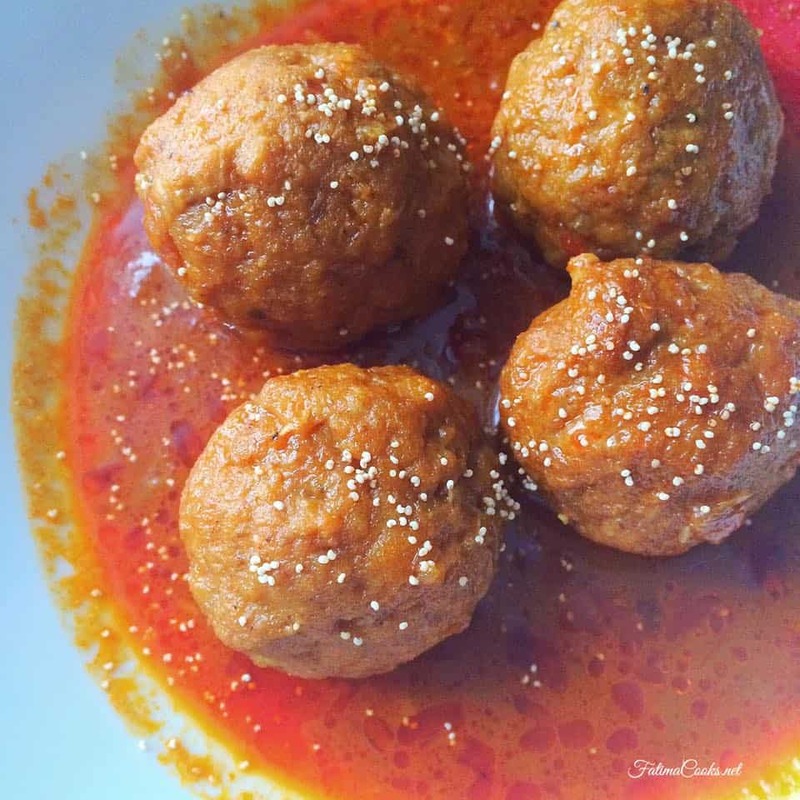 I made these koftas with chicken mince, but I am a lover of red meat therefore I think these would be absolutely glorious with lamb, mutton, goat or beef mince. To alter this recipe for red meat, see the notes below the recipe. The next day, I added some boiled eggs to the curry and served it alongside some parathas. You can most certainly add anything else that you fancy, including potatoes, chickpeas etc. This also helps pad the curry out so it goes a longer way than it otherwise would have. I hope you will enjoy this recipe just as much as me and my husband did! In a dry pan, one by one dry roast the following on high heat (i) poppy seeds, till they brown ever so slightly- about one minute (ii) coriander seeds, till they begin to release smoke (iii) cumin seeds, till they begin to release smoke and (iv) one black cardamom pod and 1 small stick of cinnamon, till they begin to release smoke. Once you've adjusted the seasonings to your liking, roll the chicken mixture into small/medium sized balls. I got 24 meatballs with my mixture. Try to avoid cracks in your meatballs - some are inevitable but try to minimise them as much as you can. In the most authentic of recipes, fresh coriander is not used for kofta curries. If you want to garnish your curry with coriander anyway, then go for it! Otherwise, you can garnish your meatballs with a sprinkling of poppy seeds or leave it the way it is. Enjoy! To adjust this recipe for lamb, mutton or beef, add 5 cups of water instead of 3 and cook for 50-60 minutes instead of 20. Yum! You can’t beat a curry especially when there’s koftas in it. And even better when those koftas are made of chicken. Delicious! Ps. congrats on your anniversary. Wow I cooked this and this was over the edge for sure. I have cooking good koftas for a while considering I have grown kids but I wanted a over the top recipe and this is it. I did reduce the amount of zeera and coriander. I also ran out of khas khas but still really good better than any packet masalas. Hi! I am going to try out this recipe….but what can I substitute for poppy seeds. Thanks in advance. Hi! I am trying this tonight, can’t wait! Can I freeze the half cooked koftas after frying? What about freezing the left over curry with fully cooked koftas? loved the narrative – you are such a fabulous story teller!! cooking today after a long time spurred by your write up!! are you on facebook by any chance?